For a chocolate shop, Xocolate isn’t exactly the prettiest one I’ve seen. When we visited, the counters were a bit of a mess, and the walls were painted hot pink with huge pictures of semi appetising looking chocolates on them. 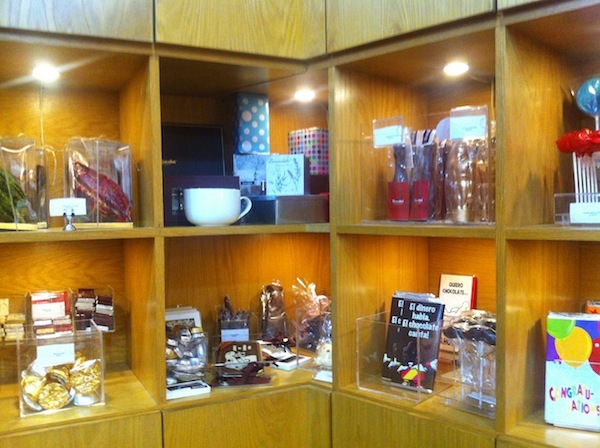 But the display case was filled with really delicious looking creations and even more importantly, they had a lot of hot chocolate options. 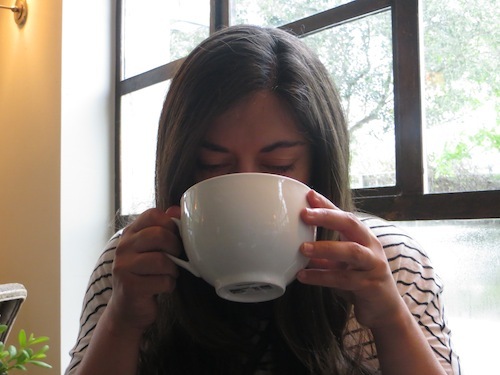 I wasn’t expecting to have a good hot chocolate today, especially considering we were visiting one of the largest shopping malls in Santo Domingo. 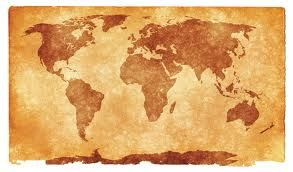 We were here to waste some time really and had been walking around looking for a spot for Rich to have a coffee. Strangely everyone else had the same idea and all the coffee shops were filled, not an empty table in sight. I suggested that while we wait for a table to empty they keep me company while I try and find a hot chocolate. Xocolate just magically appeared, and just like that the plans for coffee were forgotten and everyone ordered hot chocolates. 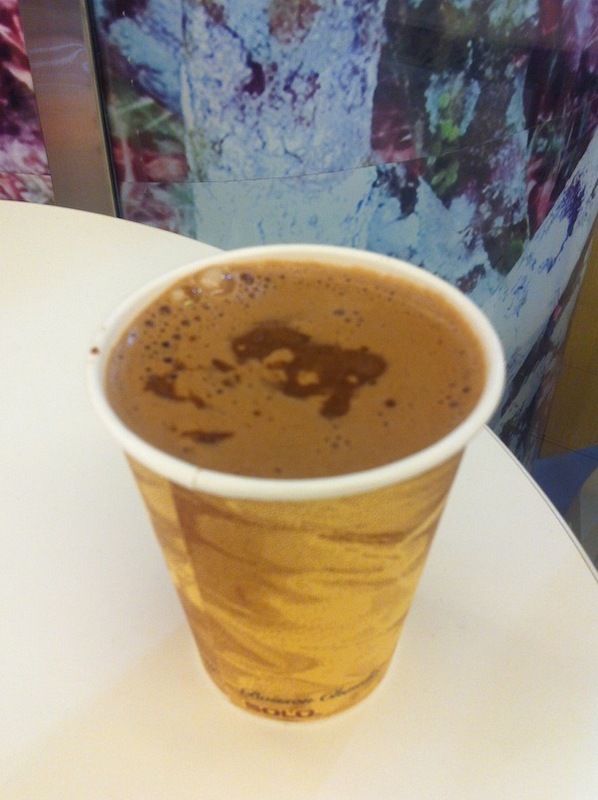 Despite first impressions, the hot chocolate at Xocolate is so good, surprisingly good, definitely one of my favourites. They have so many choices. There is one with chocolate and organges, and a bailey’s chocolate with milk chocolate, white chocolate and a shot of baileys. If you prefer one made with water they do one with 66% dark chocolate and water. One of us ordered the white chocolate with a hint of coconut milk which was absolutely delicious. The ‘Tipico’ was made of dark chocolate, cinnamon, ginger and a touch of oatmeal. The very decadent ‘Fudge de chocolate’ had butterscotch, chocolate and carmelized nuts. I ordered the ‘Especies’, dark chocolate with a hint of cinnamon and nutmeg and loved it. 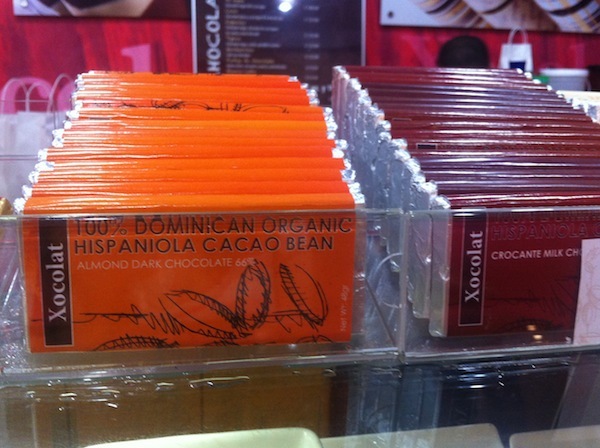 Considering so much of the chocolate that I drink at places around the world is actually from the Domincian Republic, it was nice to have some a little bit closer to the source. It was gorgeous, rich and luxurious, even though it was presented in a paper cup and we had to drink it standing up in a big shopping mall. 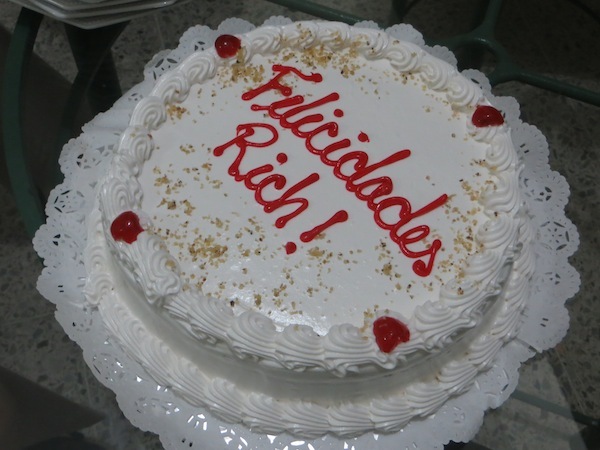 While in Santo Domingo, Rich celebrated his birthday. 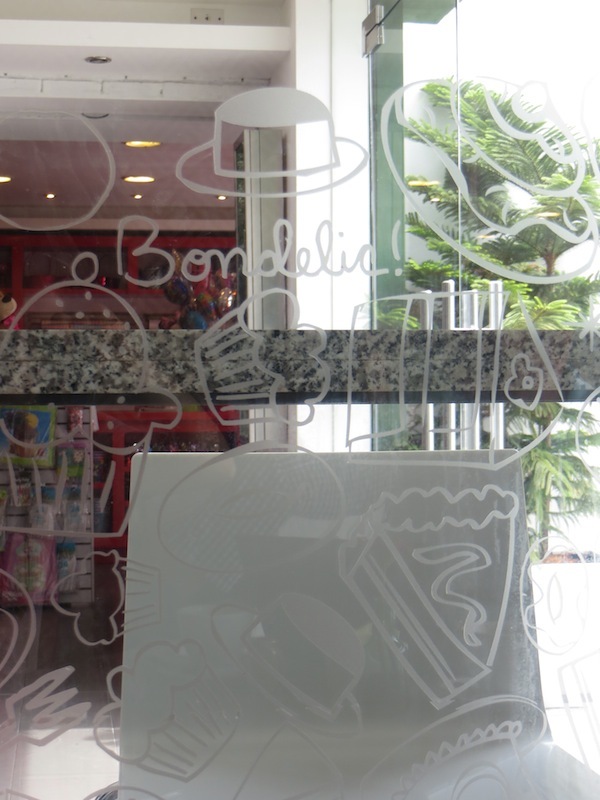 Everyone said that the best place to get a birthday cake was Bondelic and luckily for us, it was only a few minutes walk from the apartment. Bondelic is all about being happy. It was light and airy. 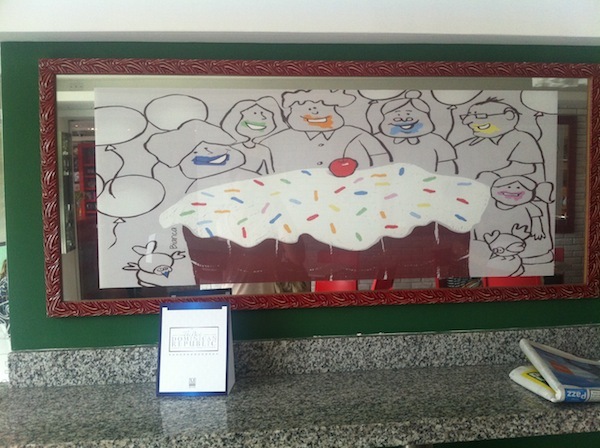 The walls and windows are covered in little illustrations of cupcakes, cookies, pieces of pies, cakes and little forks. 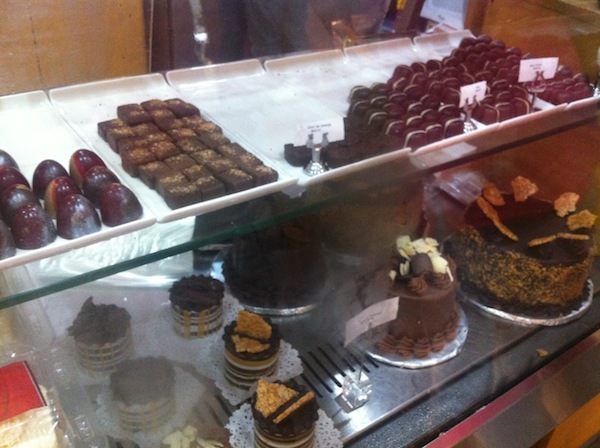 Straight ahead of you is a large counter filled with really tempting looking cakes and sweets. The first time we came here we picked up at least 7 different mini desserts to bring home to share (for research purposes of course). 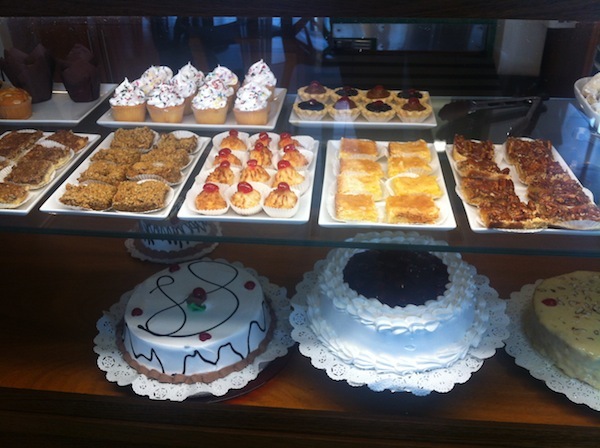 In the DR you don’t see a lot of chocolate desserts, many of the desserts are beige or white which might give the impression that they taste plain. Don’t be fooled. 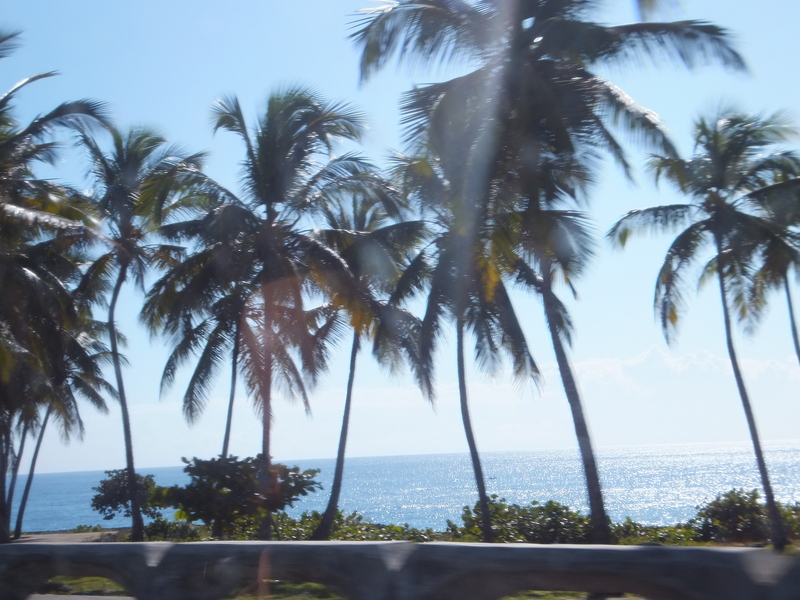 The Dominican Republic has some of the most incredibly delicious sweets on the planet. Forget about the beaches, go for the desserts! 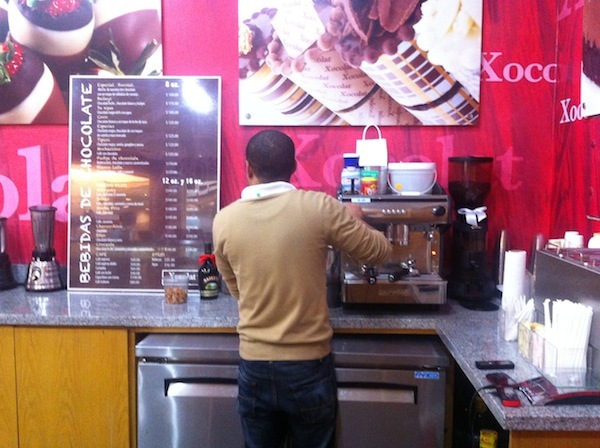 Next to the counter there was a small seating area to enjoy cakes, some small lunch items and drinks. I knew this was my kind of place when we saw several other people sitting in this area, all had obviously just popped in from the office and all were drinking hot chocolate. We sat down and ordered ours and it was very nice, not too sweet which is perfect because it pairs well with any of the cakes on offer. As an added touch we were also presented with a little shaker of cinnamon to sprinkle liberally over our hot chocolate. It was obvious that this is birthday party central. Not only was there a steady stream of people that arrived to pick up birthday cakes of all shapes and sizes, but attached to the bakery is a small party store selling candles, balloons and everything you need to plan your party. I picked up and paid for Rich’s surprise cake and that evening we ate every single bite of it. Verdict: Dangerously good cakes to accompany a nice hot chocolate. Considering they have free wifi, that table near the window could easily become my new office! Bondelic, Av Sarasota 33, Santo Domingo, Dominican Republic. When I go to visit my grandparents in the Domincan Republic, I usually only want to drink battidos which are fruit smoothies with milk or yogurt. 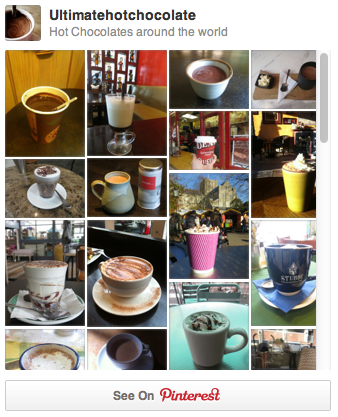 On this trip though, maybe because it wasn’t as hot as it usually is, I switched to hot chocolates. This morning we had a 5.5 earthquake just before breakfast which is scary enough when you are on the 5th floor of an apartment building. But the hot chocolate I had this morning was one of my all time favourites. 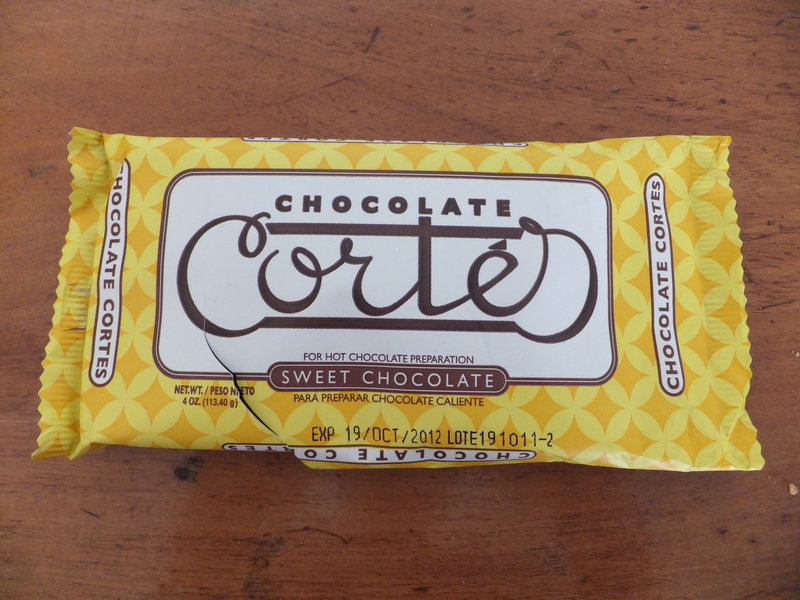 There were a few options at the supermarket and my aunt picked out Chocolate Cortes. It comes in blocks of solid chocolate. Grate the chocolate and then put it into a pot with some milk. The magical touch though is the piece of fresh ginger my mother puts in the pot with the milk. I had never thought of that. Here at home I always put cinnamon in my hot chocolates. Ginger adds such a nice flavour, a little bit of a soft kick. I sipped by hot chocolate while on the balcony watching the little green parrots fly from tree to tree. The hot chocolate was followed by breakfast, fried green plantains, the best cheese in the world (made locally) and lots of fresh fruit. Verdict: Definitely one of my all time favourite hot chocolates for many many reasons.